Our hat is so practical. It is made of 100% wool.Keep you warm in autumn and winter.Make you charming, elegant and chic. There is a bow tightly attach to the edge of the hat and the stitched mesh full covers the pillbox hat. To make a vintage british style, fashion elegant look, for womens and ladies. The little mesh hangs, giving a sense of mystery to others. Perfect for a gift to lovers, girl friend, daughter, wife, mum, suit for each women. Also can be a photography props which the film in 1950s or now. Ideal accessory for wedding, performance, church, tea party, kentucky derby, cocktail party, fashion show, carnivals, and other kinds of parties. If you have any question ,please contact us. 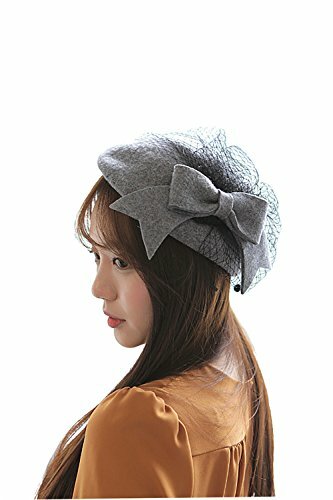 Yarn Bows Lady Elegant Beret Hat,It is very charming and elegant. Fashionable and simple but stylish hat,it's easy to match clothes. If you have any questions about this product by NE Norboe, contact us by completing and submitting the form below. If you are looking for a specif part number, please include it with your message.